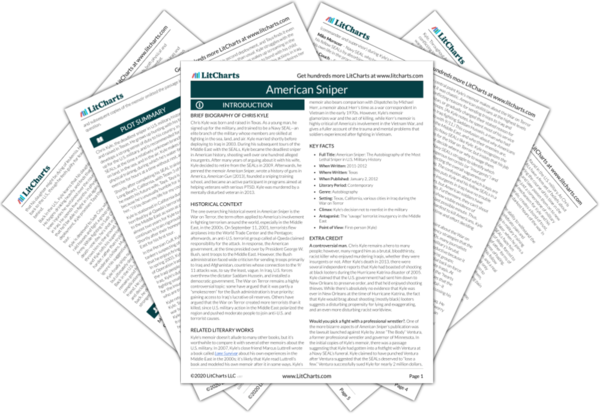 Instant downloads of all 945 LitChart PDFs (including American Sniper). 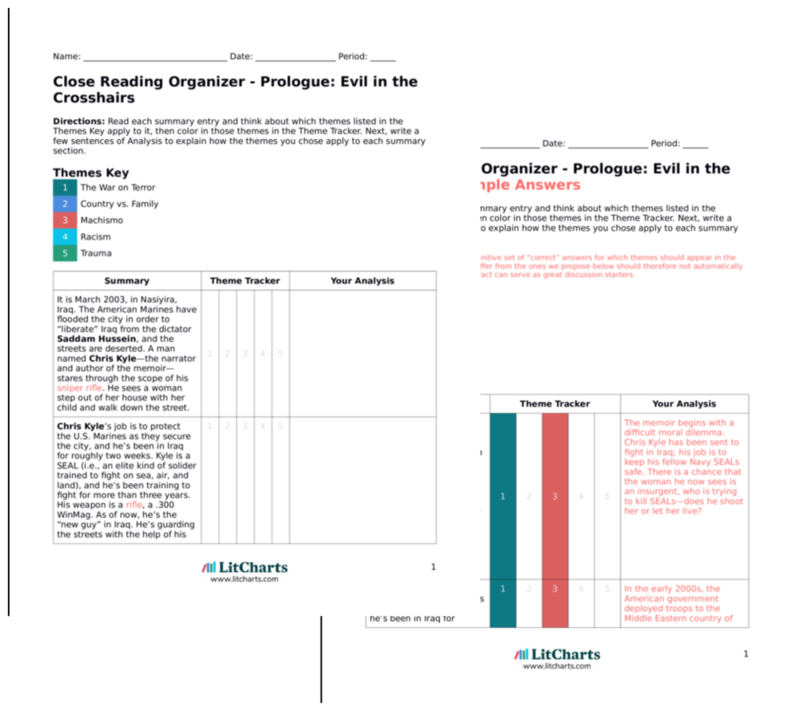 LitCharts assigns a color and icon to each theme in American Sniper, which you can use to track the themes throughout the work. In March 2003, Chris Kyle and the SEALs fly from Kuwait to Iraq. Kyle is about to embark on a mission as a part of Operation Iraqi Freedom, and he’s excited to see active combat. Kyle and the other SEALs have been sent to secure Iraqi oil reserves before the Iraqi authorities can light them on fire (which is what happened during the Gulf War in the early nineties). Some critics of the war in Iraq suggested that the war’s real goal was to gain control over Iraq’s valuable oil reserves. (Indeed, the name initially proposed for Operation Iraqi Freedom had been Operation Iraqi Liberation, until someone noticed the initials!) So perhaps it’s telling that one of Kyle’s first duties in Iraq was to secure the oil. Kyle continues to offer vivid, gruesome descriptions of the violence he witnessed in Iraq, insisting that he loves fighting and shooting at his enemies. Kyle’s tone while describing the carnage of warfare reflects his Navy SEAL machismo: by writing dispassionately about death and danger, Kyle may be trying to prove that he’s a “badass.” It’s also entirely possible that the sight of so much carnage traumatized Kyle, “numbing” him to further carnage and killing. This passage is important for a number of reasons. First, the contradictory orders that Kyle and his fellow SEALs receive reflect the confusion in the War on Terror at the highest levels of government. Second, Kyle’s initial directive to shoot all Iraqi males he sees seems to reflect the racism and Islamophobia of the “War on Terror”: the assumption would seem to be that all Iraqis are dangerous “savages” (to use one of Kyle’s favorite words). After a few months, the American government officially declares war on Iraq. Kyle continues to fight bravely, but he’s fairly modest about his contribution—he admits that other branches of the military, especially the Marines, did most of the work. Get the entire American Sniper LitChart as a printable PDF. One night in Nasiriya, Kyle and his fellow SEALs become involved in a firefight that leaves many of his peers wounded. Afterwards, a Marine hoists the American flag up and plays the national anthem. The experience is one of the most unforgettable of Kyle’s career—he’s overwhelmed by passion for his country. During his military service, Kyle remains enormously patriotic. Patriotism sustains Kyle and keeps his spirits high after devastating tragedies like the one he describes here. In the Middle East, Kyle learns more about Islam. He was raised Christian, and hates that Muslim fanatics kill those who don’t belong to their own religion—something that Christians haven’t done since the Middle Ages. He writes, “Isn’t religion supposed to teach tolerance?” Kyle guesses that the Muslims who try to kill Americans aren’t religious at all—they’re cowards who use religion as an excuse to do evil. This is the only time in American Sniper that Kyle discusses Islam, and it’s one of the most hotly debated passages in the book. On one hand, Kyle seems to believe that there is something fundamentally wrong with Islam: he implies that Islam encourages its followers to kill those who don’t belong to the faith. On the other hand, it could be argued that Kyle sees Muslim fanatics as twisting the religion to fit with their own agenda. This would suggest that Kyle has no problem with Islam itself, only its violent, corrupted versions. The SEALs continue marching north toward Baghdad, the capital of Iraq. Kyle kills “a lot of Iraqis,” noting that for every person he killed, four or five new enemies appeared. Firefights between the SEALs and Muslim extremists are frequent but quick, often lasting no more than a minute. Kyle fears what would happen if he died—Taya would be left alone. One night, SEALs report that there is a huge group of Iraqi soldiers surrounding them—the platoon probably has no more than five minutes to live. At the last minute, Marines arrive on the scene and drive away the Iraqi soldiers, saving the lives of Kyle and his friends. This passage marks the first of Kyle’s many brushes with death. Facing death, it occurs to Kyle that, if he died, Taya would be left alone. In spite of the danger that his service poses to Taya’s happiness, however, Kyle continues to fight, suggesting that, for the time being, his loyalty and love for America (and his love for fighting) outweigh his loyalty and love for his wife. The SEALs’ new mission is to destroy the Mukarayin Dam near Baghdad—a source of hydroelectric power for the entire country. But then, very suddenly, the mission is postponed, and Kyle is sent out of Iraq and back to the U.S. Kyle is furious—he can’t understand why the army would send his platoon home early. Here, and at many other points in the novel, Kyle becomes frustrated with what he perceives as the excessive bureaucracy and red tape of the American war effort. Arn, Jackson. "American Sniper Chapter 4: Five Minutes to Live." LitCharts. LitCharts LLC, 1 Mar 2017. Web. 23 Apr 2019. Arn, Jackson. "American Sniper Chapter 4: Five Minutes to Live." LitCharts LLC, March 1, 2017. Retrieved April 23, 2019. https://www.litcharts.com/lit/american-sniper/chapter-4-five-minutes-to-live.